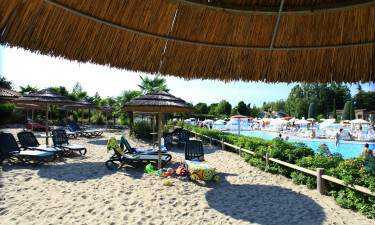 The luxury camping site is conveniently located upon the stunning shores of Lake Garda. 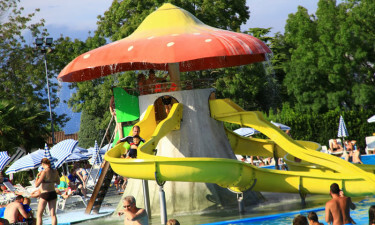 Families can enjoy a host of on-site activities and amazing weather. Please contact LuxCamp to learn more about this amazing camping holiday. Please note: Bella Italia is providing accommodation for a big school sports event in the period from April 8th to April 15th where approx. 2000 young kids aged between 13-17 years will be staying at the campsite. You must expect some noise and a lot of happy young kids in this period. 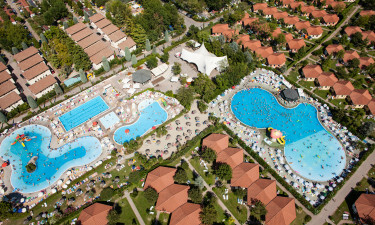 Why Should My Family Choose Bella Italia as a Holiday Camping Site? 1,200 pitches on an impressive 33 hectares of land. A wide spectrum of leisure activities. Splendid views of Lake Garda itself. Lake Garda is located between the cities of Venice and Milan. Not only does this provide some truly spectacular views of the countryside, but the weather here is extremely pleasant throughout most of the year. Unlike some other Mediterranean locations, the summers tend to be rather moderate in terms of heat while the winters are warmer when compared to inland locations. Luxury camping should always provide the ability for a family to enjoy a host of activities on or near the resort. Bella Italia certainly does not disappoint in this respect. Some of the options to choose from include swimming in 5 different pools, volleyball, tennis, bicycle hire and a relaxing sauna. Other activities such as sailing and surfing can be found only a kilometre away. Please note: The pool area is open from the 1st of April to the 15th of September. Bella Italia has come to redefine a camping holiday thanks to state-of-the-art conveniences. Wireless Internet is offered to all guests alongside power supplies to mobile homes, food provision facilities, a baby changing centre, a washing machine and a clothes dryer. Also, all sanitary facilities can be accessed by those with a wheelchair. Charcoal grilles are permitted on the pitches and even a bakery is available to offer fresh bread and pastries when desired. Camping in luxury would never be complete without the ability to access quality on-site restaurants and similar facilities. Bella Italia offers no less than four different restaurants to choose from. Corte Riga provides guests with the opportunity to try some of the most tasty local dishes while Le Terraze boasts an open-air dining experience with views of nearby Lake Garda. Made-to-order pizzas are available at all venues and takeaway menus are presented for those who may instead wish to dine in the privacy of their mobile home. There are also 5 bars found within this holiday camping site; each with its own personality and drink specials, meaning guests can enjoy partaking in a few exotic cocktails during the evening hours. Bella Italia is also able to cater to the everyday needs of all guests due to the presence of an on-site supermarket. Fruits, vegetables, gift certificates, international newspapers and common camping supplies can all be found here. There is also a bazaar for those who have been looking to purchase a few souvenirs before they depart. Of course, it is always possible to learn more by contacting LUX-camp at your earliest possible convenience.